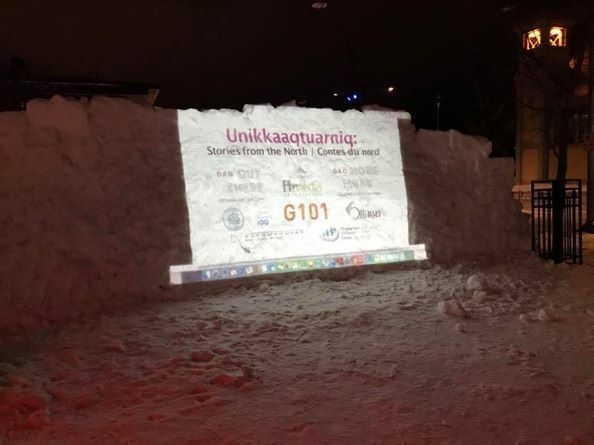 UNIKKAAQTUARNIQ: Stories from the North – Inuit & Sámi films projected onto a screen made of snow! Tonight is the final night for the screenings! This initiative has been in partnership with the Embassy of Norway with programming that has included shorts from Sámi filmmakers. The Sámi are the Indigenous people from the territories that are now known as Norway, Sweden, Finland and parts of Russia. This event is FREE and features family-friendly programming. Dress warm and come on out to enjoy the final evening. “Unikkaaqtuarniq” means Storytelling in the Inuktitut language, and is an ancient form of magic, with the power to connect the past with the present, teach lessons, impart values, heal, to explain the world and connect us to the universe through language and mythology. The stories in this program come from the Inuit people of Canada and Sami of northern Scandinavia, Indigenous peoples who have thrived in the arctic regions of the world for thousands of years, sharing stories inside the Sami lavvu and Inuit tupiq, enduring the changing seasons of dark and light, of colonialism, of climate change. Although these cultures live thousands of kilometres away from each other, they share a common history of resilience in their language, culture and magic through storytelling. More information is available on their FB Event Page. Iđitsilba Trailer from Davás film on Vimeo. A powerful song and music video that is a statement about the continuing presence of the Sami people. An Inuit woman becomes the first person to ever be featured in a choreographed snowshoe dance video. A video essay about the perspective of a teenager on his hometown. Nivi Pederson • Greenland • 2017 • 7 Min. Shovelling snow in the capital of Greenland is a big part of everyday winter life. Three Nuuk residents share their reflections – and frustrations – about this seemingly never-ending task. The Tao of Snow Shovelling! Anssi Komi, Suvi West • Sapmi – Finland • 2017 • 12 Min. Pregnant with her first child, Helsinki-based director Suvi West shares her longing to return north to her ancestral lands to ensure her child has a northern Sámi identity. While her Finnish partner Anssi does not feel at home up north, his love for her makes him contemplate a change in lifestyle and a move to Sápmi. This personal documentary is a portrait of a couple at a crossroads in their lives and a testament to one’s deep love for their land. The story of a ferocious polar bear turned to stone by an Inuk shaman. Hand-drawn and painted by Henoche in a style all her own, Shaman shares with the world her perspective on this Labrador Inuit legend. Asinnajaq • Canada • 2017 • 14 Min. Mikkel is a reindeer herder who has the entire responsibility for the herd of his family. He has a tough shell like a sámi boy should have. But in his inside there is chaos. Grandmother and Áile are close to one another and Grandmother teaches Áile the powers of Nature and healing, however Áile has a secret that puts their bond to the ultimate test, forcing Áile to open up, but can she save their relationship? A young girl seeks help for her afflicted dog, but other members in her family need more help. The mother is lost in her own mind, the father wants to cure his loneliness and the girl is searching for truth. The film takes place in a small Sámi home in a remote area in Northern Norway and portrays a dysfunctional relationship between father and daughter. This entry was posted in Aboriginal / Indigenous, Asinabka, Film, Film Festivals, Identity, Indigenous Culture, Ottawa's Art Scene and tagged Arctic, Asinabka Film Festival, indigenous, Inuit, Landsdowne, Ottawa, Sami, Silla, Unikkaaqtuarniq by admin. Bookmark the permalink.